Luxury expedition cruise line Ponant is taking things to the next level. The French cruise company recently ordered what it classifies as the cruising world’s first electric hybrid icebreaker powered by liquefied natural gas (LNG). Ultimately choosing Fincantieri’s Norwegian subsidiary, VARD (VARD Holding Limited), to construct the ship following Barry Rogliano Salles’ public tender and participation from various European shipyards, the vessel is scheduled for delivery in 2021. In addition to the yard itself, Ponant is partnering with other leading companies to bring the new vessel to life. Aker Arctic is known for developing and designing icebreakers specifically and GTT supplies LNG storage technology. Wärtsilä works in dual fuel diesel engines, while ABB provides azipod propulsion systems and electric hybrid structures. 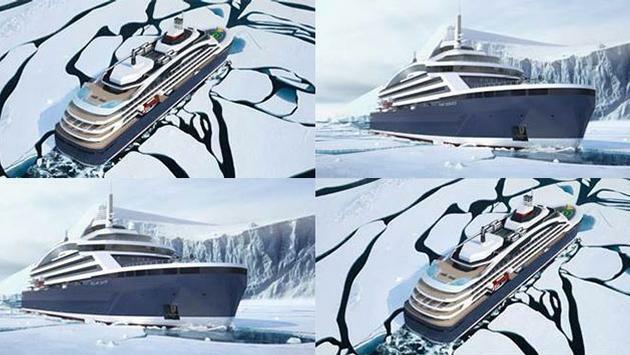 Aker Arctic and Stirling Design International are cooperatively credited with the ship design which will encompass 135 staterooms and luxury service. It will be an environmentally-friendly certified clean ship. Its future polar destinations will be those far off the beaten path like the true geographic North Pole (90 degrees North Latitude), the Weddell Sea, Ross Sea and Peter I Island. While there are other previously announced hybrid expedition ships coming from the likes of Hurtigruten and Quark Expeditions, they are not explicitly described as icebreakers nor are they set to utilize LNG. Ponant’s newest order adds to the long list of expeditionary new-builds, contributing significant growth in the market segment. The vessel is in addition to four other new expedition yachts coming soon from the brand. Le Laperouse and Le Champlain will sail in 2018, and Le Bougainville and Le Dumont-d’Urville will launch in 2019. Their designs showcase the highly-anticipated Blue Eye underwater observation lounge. Additional features of the latest ship have yet to be announced.